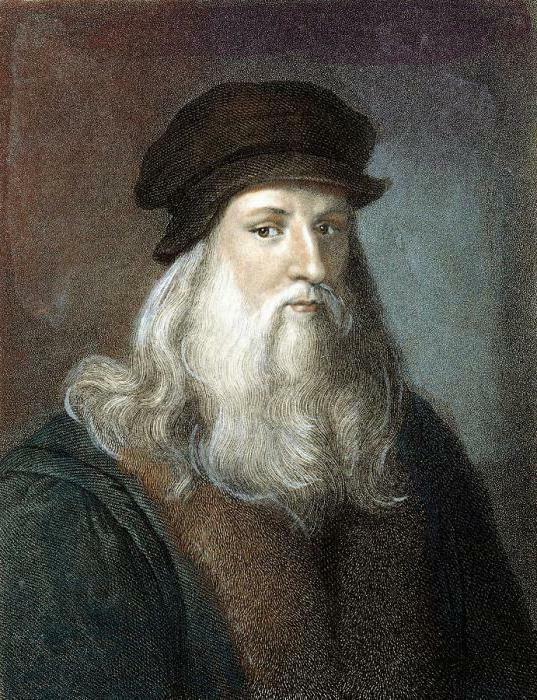 Leonardo da Vinci - the genius-universal, the flagship of the Renaissance the art and science. and therefore his paintings can often be seen not only as unique works of art, but also as a result of serious scientific observations and conclusions. All of his scientific insights and discoveries embodied in drawings, sketches, mock-UPS, many of which can be likened to works of art, as well as works of art - paintings, drawings, sculpture, etc. - are the focus of his scientific thought. Many of them, seemed once fantastic, now interpreted as prophecies. His discovery was ahead of its time. Because many have not been implemented then in reality. It is in relation to the work of da Vinci is quite applicable phrase: "there is No limit to perfection". And not because followers can make created them better, but because the master himself so always wanted to the perfect incarnation of the idea that the ideal this was pushed still further, and eventually Leonardo's work was not finished, as it could not achieve the desired ideal. the Painting "Baptism of Christ" Leonardo da Vinci was the last joint creative project with his teacher Andrea del Verokko. At that time Leonardo has already graduated from training in the workshop of the famous painter and started his own way in art. By the time of creation he was about 20 years. in Fact the figure of Jesus Christ and the image of John the Baptist belong to the brush Verokko, and the kneeling angel and the landscape created by the young Leonardo. There is a story, described Giorgio Vasari what if the images created by da Vinci, was so much more beautiful than those that he wrote to his teacher that Verokko since ceased to do. 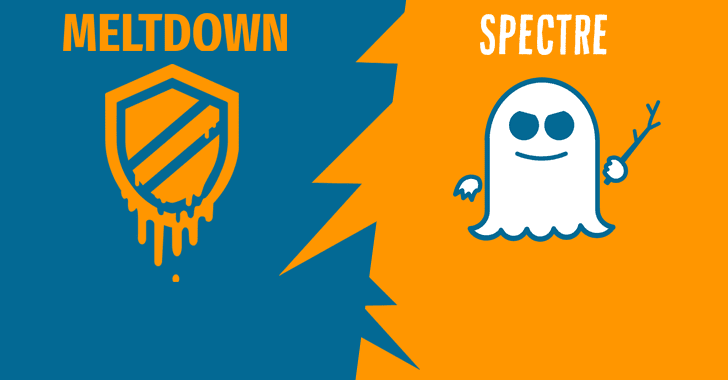 However, this information is not confirmed by facts. from the painting "Baptism of Christ" began to emerge in the works of Leonardo da Vinci, his unique style, called painfully tender. 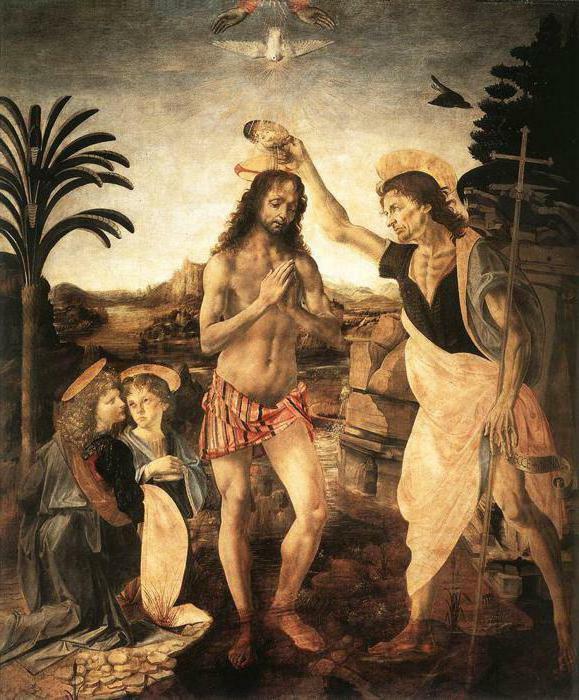 Now picture Leonardo da Vinci's "Baptism of Christ" is exhibited in the collection of Italy, in the Uffizi gallery in Florence. the theme of the painting "Baptism of Christ", or baptism of Christ is one of the most popular in world art from different historical periods and styles. He had gone by and the creativity of the Titan of the Renaissance-Leonardo da Vinci. According to the biblical texts, at a time when the Bank of the Jordan river in Jerusalem, the prophet John the Baptist to perform sacred ablution of the people, preparing them for the coming of the Messiah, there is Jesus Christ. He came once at the Bank and turned to John with a request to baptize him. Surprised John: "I'm Not you, but you should baptize me". However, baptized Jesus and was nicknamed since then, the Baptist. Description of Leonardo da Vinci's "Baptism of Christ"
In the painting "Baptism of Christ" by Andrea del Verokko and Leonardo da Vinci in the center of the canvas in the foreground is Jesus Christ. To the left of Jesus (right for the viewer) - John the Baptist. In his left hand he holds a staff with a cruciform top, and the right - bowl with Myrtle, whom he baptizes the son of God. 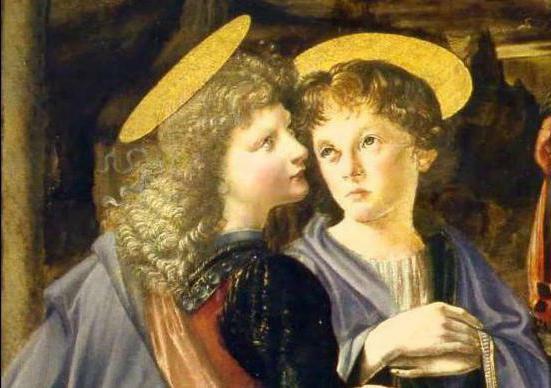 On the right there are two kneeling young angel witnesses the ordinances are unhurried conversation. Quiet and solemn, the surrounding nature is consonant with the significance of what is happening. Jordan quietly rolls its waters past in the background, as if contemplating and promoting the events. In heaven we see two open towards the viewer of the palm, of which viparchive white dove. The palms symbolize God the father, the dove - God the Holy spirit. On the one hand, they are symbols of God's blessing what is happening ordinances, and with another - the symbol of the Trinity of the divine essence, the all-Knowing and all-Seeing, Omnipresent. In favor of the first said the quote from the gospel of Mark: "And when out of the water, he saw John risorseumane the heavens and the spirit like a dove descending upon Him. And a voice came from heaven: Thou art My beloved Son, in whom I am well pleased." Landscape in the painting, according to some critics, resembles Monsummano - village near the birthplace of Leonardo of the Vinci village is one of those cherished places that da Vinci depicted in his paintings. If you refer to the color scheme of the painting "Baptism of Christ" Leonardo da Vinci, we can distinguish the predominance of blue and white colors. It is not surprising, because from the point of view of their religious significance the blue tones represent the infinity of the sky, of another eternal world, connecting earth and heaven, and the white symbolizes the Divine light, purity and Holiness. These colors used by the authors in creating images of angels and John the Baptist, but John's body wearing a shirt of black color which represents death. And this is no accident - the Ministry of John the Baptist, the Lord led him ultimately to his tragic death. A red color sleeveless of God the father and loincloth of Jesus Christ means the victory of life over death and love and to all people. About the upcoming the death of Jesus resemble the black stripes on his clothes. Gold stripes, halos and glare, coming from the hands and the dove, represent the radiance coming from God, a symbol of blessing. Masterpiece of Leonardo da Vinci and Andrea Verokko always causes admiration of spectators. However in books and other information sources are almost no opinions of our contemporaries about the work. 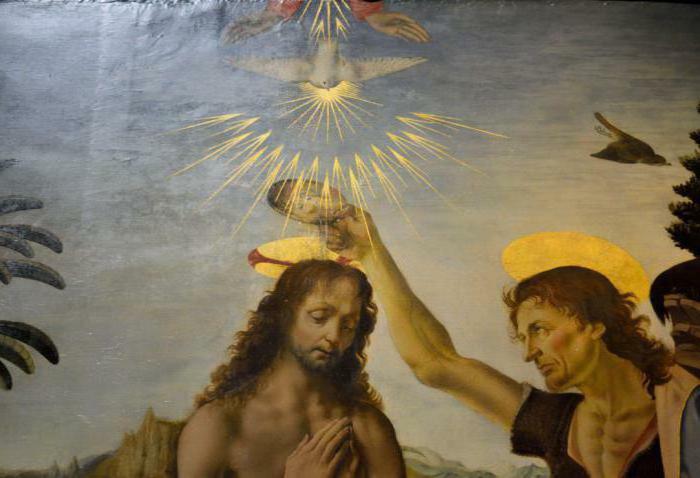 The question arises: "Why in blogs and travel pages in VK among the discussed works not found detailed descriptions pictures and reviews of the "Baptism of Christ" Leonardo da Vinci?" 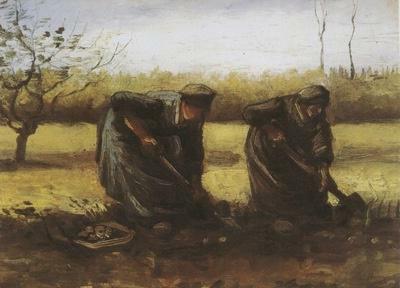 Description of van Gogh "the potato Eaters"